Call for posters now open: deadline is 18 September 2018 at 23:00 UTC. The meeting will be held in Gaborone, the capital city of Botswana. 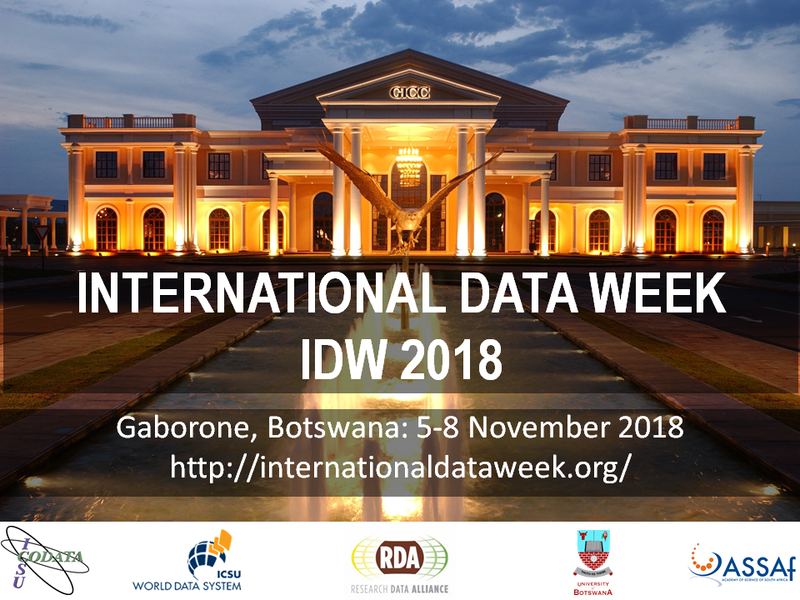 International Data Week will be locally led by the University of Botswana. The university will deliver the IDW through a committee comprising of a consortium of research institutions, public and private organizations. This consortium includes the national Open Science and Open data Forum Department of Research Science and Technology (DRST), Botswana International University of Science and Technology (BIUST), Botswana University of Agriculture and Natural Resources (BUAN), Botho University (BU), Botswana Innovation Hub (BIH), Botswana Institute for Technology, Research and Information (BITRI), Botswana Communications Regulatory Authority (BOCRA), Botswana Fibre Networks (BOFINET), Department of Information Technology (DIT), Joint Minds Consult (JMC), Botswana Library Consortium (BLC), National Food Technology Research Centre (NFTRC). ICSU Committee on Data for Science and Technology (CODATA): ICSU-CODATA was established in 1966. Its membership is comprised of National Academies, Science Councils, international Scientific Unions, and related organizations that care about data. Its focus is on creating both a culture and a framework of standards, agreements and protocols that enable data to be shared and reused. ICSU World Data System (ICSU-WDS):ICSU-WDS was established in 2008 (its predecessor bodies were established in 1957). Its membership is comprised of data repositories, data service providers, and their partners. Its focus is on identifying, creating, and sustaining institutions that provide stewardship, long-term preservation, and access to data.